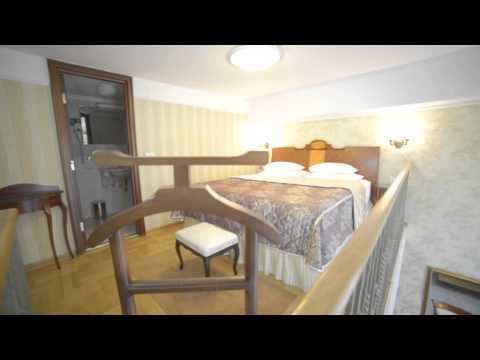 These rooms are a trademark of “Moskva” hotel. They give the feeling of exceptional comfort and luxury because of 4 m high ceilings and the space of over 30 m2. Every room is unique, decorated with works of art and antique furniture. An elegant sofa on the lower level is an enjoyable place for rest, while a big bed on the gallery floor guarantees a comfortable night’s sleep. A toilet and a bathroom, two plasma TVs, a pull-out sofa – they all provide enough comfort for the whole family. Grandiose windows make waking up to a sunny morning in this room an exceptional experience.